I'm now smoking the last of these from 2012 so its aged 3.5 years from when I bought it. When new I wasn't a fan. A bit raw with ammonia. 1st few draws are dominated by mocha and chocolate. This quickly disappeared to go straight to white pepper. Getting towards 1/3 in and the chocolate returned. Getting to the last third and a bit of ammonia is present but mainly spice with heat building in the mouth and on the lips. 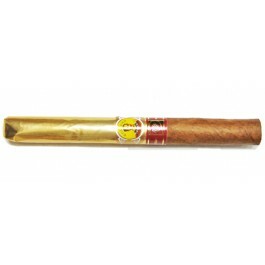 Do not be put off by the dimensions of this elegantly slender Cuban cigar. It's overall length gives the illusion that it's quite slimmer than it really is. It is long, dark, and silkily oily - QUITE seductive...then you light it up! The flavor profile is everything you have come to expect from Bolivar; full and very well balanced (the ones I have received have all been '09). They open up quite early and finish very well. I am extremely pleased with myself for giving the Bolivar Gold Medal a shot. I am certain they will always have a spot in my humidor...Right next to the Royal Coronas and the Bolivar Belicosos Finos! An economically practical cigar for more frequent indulgence and definitely one to share. Cheers! These Cuban cigars are smooth, but yet very full!! It takes about an hour and half to smoke one of these Bolivar Gold Medals. They are great with a cup of coffee or blue label. Somewhere around the middle of the cigar, the taste has changed to a chocolate taste. Very nice surprise to me, since I love chocolate. The last third of these cigars seems to be plugged a little bit, maybe I was smoking them too fast. But just a quick roll and press between your fingers takes care of that. The cigar gives off a nice amount of smoke and pure Cuban aroma!!! Man, I just love that smell! Try them, I like these Gold Medals and my usual favorite is a Montecristo #4. Great way to bring them back guys, keep up the great work!!! This Bolivar Gold Medal is definitely a Gold Medalist that just won the boxing match! It is a petite 42 gauge ring cigar but beware, its size is not a limit to its strength. Small but Mighty, it packs a strength of a true Warrior. It is beautiful full bodied cigar which will have your senses at attention until the match is over, nice even burn with superb construction. A must have for every cigar lover! I have always loved Bolivar cigars and wanted to try the gold medal for a long time. Cigar Terminal has such a great deal on them, I figured I would get a box and I'm really happy I did! These cigars arrived in under 5 days and they were all in perfect shape. The light brown wrappers were flawless without a single vein or a spot of a different shade. I let them sit in my humidor for a little over a week and finally couldn't take it anymore so I lit one up. Upon lighting this cigar, I noticed that awesome Bolivar Cuban twang and earthy flavors that I love so much. There was a good amount of woody notes, especially a sweet cedar undertone. This flavor stayed very consistent for the first couple inches. The earthy notes were very strong, but that sweetness of the cedar mixed with that Cuban twang made the flavor profile very nice. A couple inches in, there was a mild spice that came out to compliment the earthy tones. Just shy of the halfway point, there was a feint chocolate note in the background. At the halfway point, the flavor picks up quite a bit. The earthiness picks up and becomes overpowering to some of the other tones. The cedar is still there, but it isn’t a strong as it was in the first half. The spice finally picks up a little bit and sticks to the palate. Along with the spice on the palate, there was a little bit of leather that attached to the palate as well. This cigar finished strong and smoked wonderfully the whole time. I would buy these again from Ken at Cigar Terminal in a heartbeat and I'm glad I found your site.